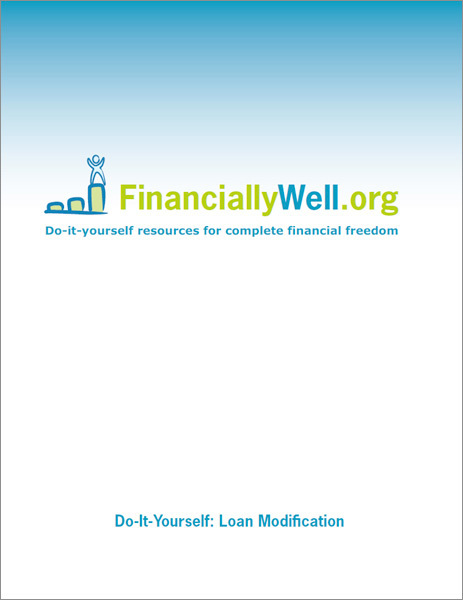 Financial Ebook 1: Do-It-Yourself: Loan Modification is a succinct resource outlining and documenting options to consider when dealing with or attempting loan modification. Do-It-Yourself: Loan Modification also describes alternatives to homeowners besides loan modification and gives you the vocabulary/keywords needed when communicating with lenders and banks. Do you need to make a decision on which route to go in order to avoid foreclosure? If making a decision on your own is difficult, Do-It-Yourself: Loan Modification lists free counseling resources. The resources, advice and information contained in Do-It-Yourself: Loan Modification can save you time and money. The process of loan modification could cost you thousands of dollars when pursued by a lawyer or other real estate sources. Loan modification has always been one of the options available to homeowners facing financial troubles. Recently, loan modification has gained popularity and awareness with the general public since President Obama’s administration has regulated a government version of the process to help troubled homeowners. From this regulation, a new type of loan modification has emerged and been promoted by the government under the “Making Home Affordable Plan”. Although the new government plans are attractive and very beneficial, not everyone can qualify. For those who don’t qualify, there is still the option to modify their loans traditionally, through the bank. Do-It-Yourself: Loan Modification provides options besides the government or traditional approach, options which could help prevent issues such as foreclosure or bankruptcy. Section 3: IF Not Foreclosure, Then What? Section 4: Do You Qualify for Loan Modification?